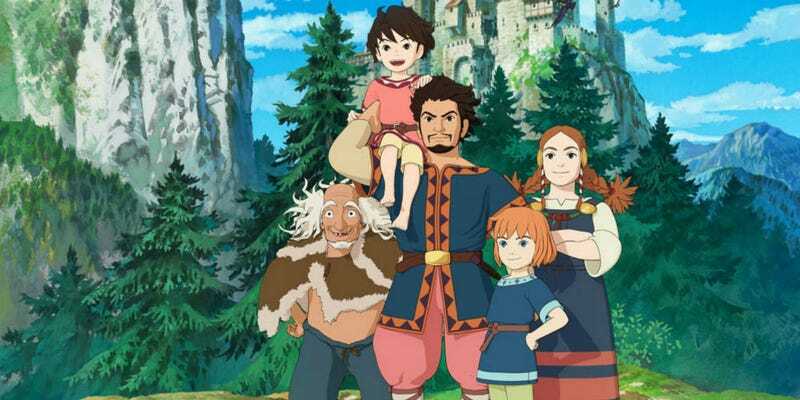 The first season of the Studio Ghibli-produced show Ronja the Robber’s Daughter arrived on Amazon Prime last week, marking the first time the show has been available in English in the US It’s a kid-friendly tale of a young girl raised by robbers who meets a young boy raised by rival robbers, and how their friendship changes everything. But it’s a very, very slow tale. I watched the first five episodes of Ronja to get an idea of what the show was like, and it’s undeniably unique. Based on a book of the same name, the series is directed by Goro Miyazaki, son of legendary filmmaker Hayao Miyazaki, and a celebrated director in his own right. With those influences, obviously, the show is beautiful. Like almost anything Studio Ghibli touches, the costumes, settings, music, and animation are all gorgeous. But the storytelling is unbelievably slow. Episode one is about Ronja being born. Episode two features her father, the robber Mattis, appreciating parenthood. Episode three is about Ronja discovering the forest and episode four is more of Ronja discovering the forest. It’s not until the very end of the fourth episode that the show’s second main character, the boy Birk, is introduced. The fifth episode is basically just Mattis stomping around mad that Birk and his father Borka (Mattis’ rival) had invaded their castle. That last one is the most telling; you’d think after finding out your biggest enemy had invaded your home, you would immediately go confront him. But no, on Ronja an entire episode is spent making sure the audiences know the most obvious thing ever: Mattis is angry. The confrontation comes in episode six. The show’s storytelling may speed up after episode five, but future episode descriptions include “Ronja falls ill and spends three days in bed” or “Ronja and Birk have a big argument over a lost knife,” suggesting that glacial pace continues. It feels like Miyazaki had a good idea for a two-hour movie, and then had to somehow stretch it into 26 half-hour TV episodes. While the pacing can be taxing, the show certainly isn’t all bad. It does allow for a lot of great, exaggerated character moments ranging from poignant ruminations on nature to wacky Saturday morning cartoon hijinks. It also makes the whole season very bingeable. With so little happening in each episode, you’re tempted to keep going for the story to actually unfold. And if you can get past the pace, the show has other charms, especially watching Ronja’s journey from baby to fearless, capable 10-year-old. Plus there’s mystery, too—why aren’t there any other women in the castle besides Ronja’s mom? Why do people keep coming through the forest if they always get robbed? What are the three keys on Ronja’s mom’s neck, and is there a deeper reason for the rivalry between Mattis and Borka? Plus, can we learn more about the half-bird, half-human terrors called Harpies? Honestly, after watching the first five episodes I’m not sure I care enough to sit through another seven hours to find out the answers. But on a rainy day, Ronja the Robber’s Daughter provides a suitable escape into a mysterious, beautiful world with plenty of quirk. The story unfolds incredibly slowly but the lessons it provides about living in the moment and the simple joys of life are worthwhile. Ronja the Robber’s Daughter first premiered in Japan in 2014. It’s now streaming, with narration from Gillian Anderson, on Amazon Prime.